All Service Locksmith 4 U provide a supply and installation service with qualified and experienced fitters fitting window security grilles in all sizes and UK locations. Grilles provide the perfect combination of security and aesthetics because you maintain the look of your windows and doors.There are plenty of variations to choose from including a side-folding full enclosure or side-folding open air and upward coiling grille; a gate grille, diamond mesh grille or retractable grille. 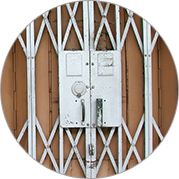 Barred grilles and strapping grilles are popular, along with ornamental grilles which provide security with good design. For solid domestic and commercial security, heavy duty steel or iron security bars will deter would-be burglars. In a variety of styles and colours, these bars can be tailored to suit the design, look and feel your property. Many burglar bar systems are removable and can often be adjusted to let light in without compromising protection. All Service Locksmith 4 U supply and fit a wide range of security shield products from steel custom security screen doors, sun screens or window guards to specialist bomb blast and ballistic protection, specially designed for high security applications. The best products provide protection for doors and windows while allowing plenty of light in. Whether your security requirements our shields are fitted internally or externally, with or without UV Filters and scratch-resistant finishes with prices to suit all budgets. If someone tries to kick your door in, the door frame will be seriously weakened and you will need London and Birmingham bars, both of which are recommended by the Police and insurance companies. London bars fit over the strike box (also called the staple or keep) securing them firmly to the frame. Birmingham Bars have a dual-purpose flat security bar used to strengthen the hinge side of the door frame on doors that open inwards. All Service Locksmith 4 U also provide and fit lock guards, frame guards, hinge guards, staple guards and door guard grilles. And if you are not sure what you need, please ask and we’ll give you the best possible advice and prices.